Although most people think that Brazil nuts are a nut, they are actually a seed. They have a rich and creamy flavor which makes them a great addition for so many different desserts and other dishes. They are found in South America and are a staple food in the Latin American diet. 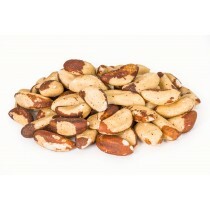 Brazil nuts are known for their high levels of selenium, a mineral vital to humans. These nuts are also rich in protein and a great choice for vegetarians and vegans as well as raw foodists.